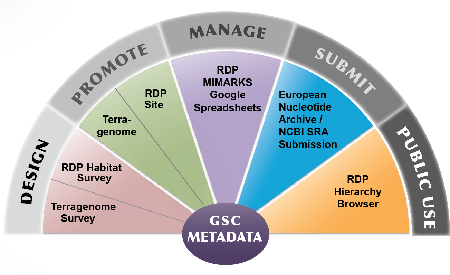 More information can be found on the MIMARKS homepage where you can also find other projects promoting the MIMARKS standards like Terragenome (International Soil Metagenome Sequencing Consortium). 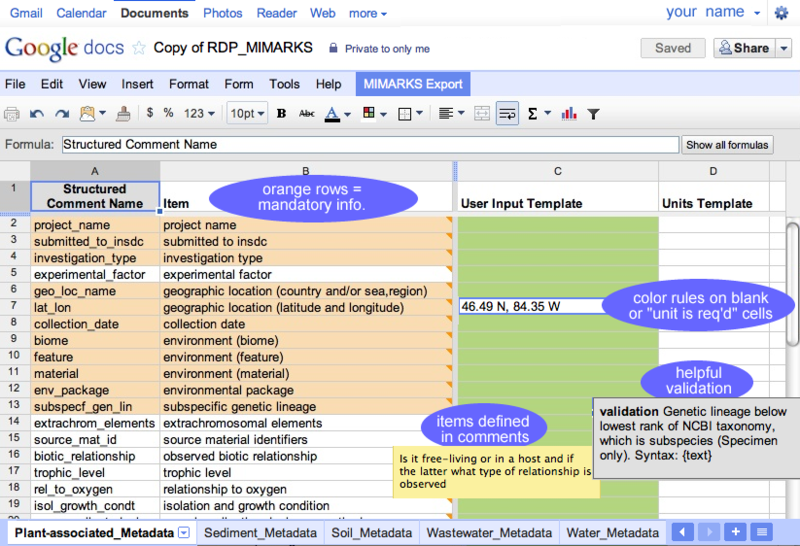 RDP developed the MIMARKS GoogleSheet to help you manage the metatdata for your samples! email rdpstaff@msu.edu with your comments or suggestions. You will need to "Sign in" to your Google account (upper right hand corner) in order to activate the menus. Use "File, Make a Copy" to get your own spreadsheet. DO NOT download or copy into an Excel spreadsheet as you will lose all embedded definition comments and validations. THIS COPY WILL NOW BE YOUR OWN Google Spreadsheet to edit and share/protect as you see fit. There should be a User Input Template and Units Template column for each sample you would like to manage. Do not enter data into any cells other than those in the "User Input" or "Units" column. You may change the column heading of the copied User Input columns to contain your sample names. All rows containing mandatory attributes and cells requiring a unit entry are highlighted in orange. A new column for "Preferred Units" has been added in v. 4 (Summer 2014). (CAUTION: duplicate structured_comment_names and item names are not allowed in the submission packages). Share your google spreadsheet with your research colleagues to view or view and edit according to your needs. After you collect your metadata, you can export your MIMARKS-compliant data by selecting the menu item "MIMARKS Export". Choose your desired output: WebIN or Sequin in RDP_MIMARKS. Use our added MIMARKS Export tab and select your desired format. You may need to give permission to run the script. A new window will open with your results as text to COPY and PASTE into a text file for your selected submisssion package. Col. A = Structured Comment Name: name of a checklist item as it will appear in GenBank structured comments. Col. B = Item (attribute): full name of item as it appears in the publication. Note: definitions (a description of the item, including links to ontologies and other resources that can be used to fill in values for the item) appear in the embedded comments of this column. Col. C = User Input Template: Validated input column for user data. It is set up to help you by validating (verifying) your input according to MIMARKS requirements. Once copied for your samples, you can replace "User Input Template" with your sample name as the header. Col. E = Preferred Units (when designated). New with v.4 (Summer 2014).